Matthew Dresden is at the Institute of Transportation Studies at the University of California, Los Angeles, completing work towards the MA in Urban Planning and the JD in law (dresden2005@lawnet.ucla.edu). Must a Bridge Be Beautiful Too? 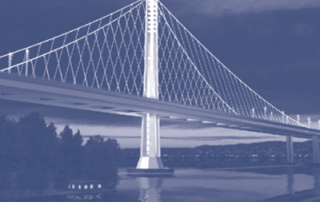 In late 2004, California Governor Arnold Schwarzenegger announced that as part of statewide budget cuts, the design of the new eastern span of the San Francisco-Oakland Bay Bridge would be dramatically scaled back. At the time, estimates of the new span’s cost had risen to $5.1 billion from an initial estimate of $1.3 billion. Instead of a single-tower “signature span,” Schwarzenegger proposed a towerless concrete viaduct—a slightly raised road across the water that was compared (unfavorably) to a freeway onramp. The span is being rebuilt because of longstanding concerns by Caltrans and state civil engineers about its seismic integrity. Part of the existing structure collapsed during the Loma Prieta earthquake in 1989, and since then the bridge has been considered unstable, although it has remained open because it is indispensable to Bay Area traffic flow.